A common confusion in specifying wall types for a building lies in the difference between Rw and DnTw. Misunderstanding this can go either way in terms of under or over performance; therefore getting this simple difference goes a long way to ensuring a good result on site, as well as presenting value engineering opportunities. DnTw is a term that relates to on-site sound insulation. This is the target that is measured against in pre completion testing in line with BB93 specified DnTw values. Because it is on site, it accounts for all sound transmission paths including direct through the separating partition and any flanking paths around it (i.e. through ceiling voids, ventilation paths, junction detailing). Rw is defined as a laboratory rated sound reduction index. Wall constructions should be specified as this, measured in isolation from any other sound flanking paths. The same construction measured in a lab will get the same result every time, but measured on site will vary from room to room, project to project. The conversion from Rw to DnTw has to account for the size of the separating partition, the volume and reverberation time of the ‘receiving’rooms. It must also incorporate a factor to account for potential flanking transmission on site due to construction quality or inattention to junction detailing. Therefore it is not a simple case of RW = DnTw + X dB. The RW can vary significantly between partitions, even if they require the same DnTw. Figure 1 summarises this. Why does the RW vary when the DnTw is the same? 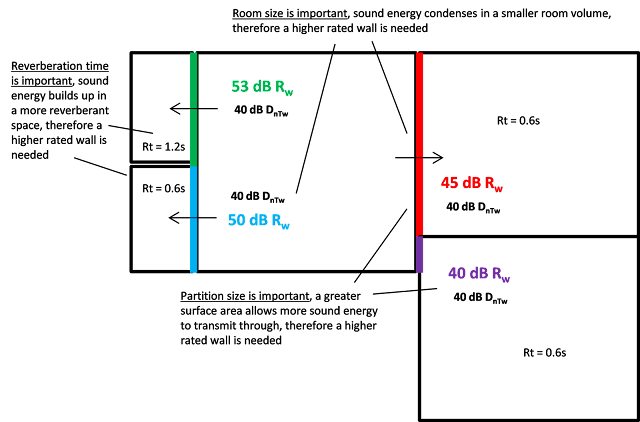 Clearly from Figure 1, if the same wall type Rw (say 45 dB) is used everywhere the DnTw is 40 dB, there will be rooms that fail. 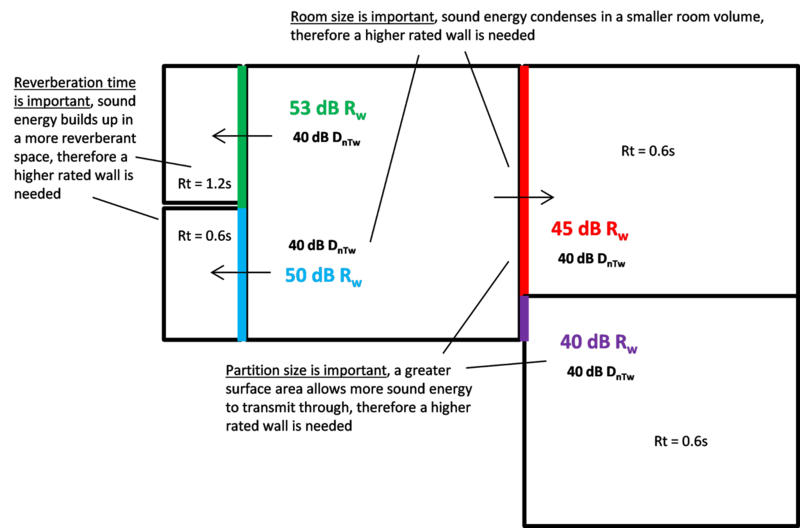 On the flip side, if the most onerous requirement of 53 dB RW is used for all 40 dB DnTw walls, then some areas will be exceed the required performance by a considerable margin. Of the two scenarios, it is usually the latter that will occur within a design. Therefore clear cost savings could be made by assigning wall types to partitions based on the required RW, not simply the DnTw. This can all be done whilst retaining the same number of wall types. In fact by careful design and attention to construction details, the build ups of wall types can be engineered to reduce unnecessary overspend on thicker or denser plasterboard products and still maintain the on-site acoustic performance. Reducing every dB of overdesign quickly sums up when applying over projects, schemes and larger frameworks, particularly those with common shared constructions.